Consumers of the gaming industry have come to realize that conventions are the one opportunity when they can come face-to-face with game studios. Indies and Triple A’s alike put on their best show and present their finest to diehard fans who have trekked from near and far to see them. However, over the past few years, we have seen gaming conventions begin to hit a stall — they’re becoming a tricky thing for developers. With limited space on the floor and airtime on their showcases, some companies are taking shortcuts and alternate routes around expos to reach consumers. As a PR student, attending this year’s PAX East was a fascinating experience. It was interesting to see what kind of presence each company had … How was their booth set up? What did they give out for free? What kind of merchandise did they sell? What games did they demo? PlayStation went all-out to promote their Days Gone demo and even designed their booth as a post-apocalyptic hideout with real zombies! Discord became the “cool kids club” of the PAX exhibit floor with their light-up cube seats, free swag, and neon signs. What stood out more than who was there, was who wasn’t there. Several notable Triple A’s had a lacking or nonexistent presence. Ubisoft only had a 10-by-10 merchandise booth, with no playable demos or giveaways. Others like EA were completely missing from PAX East. Then … there was Bethesda. When I was told by my friend at PAX to go check out the Bethesda set-up, I thought he was kidding. I had looped the entire exhibit hall several times by that point, and unless they were hiding in the back among the indie booths, Bethesda was not on that floor. No, Bethesda wasn’t on the PAX showroom floor. They had a set-up in the hotel next door. “Bethesda Game Days” is a two-day, mini-Bethesda convention. 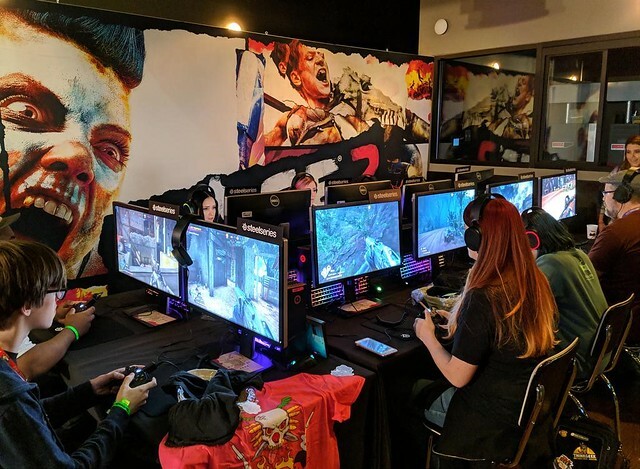 Attendees were able to play demos for RAGE 2, The Elder Scrolls Online: Elswery, and The Elder Scrolls: Legends. For each demo played, fans received free gifts (like t-shirts, popsockets, masks, keychains, commemorative coins, and more). There were also giveaways, open to all attendees, of custom gaming consoles! 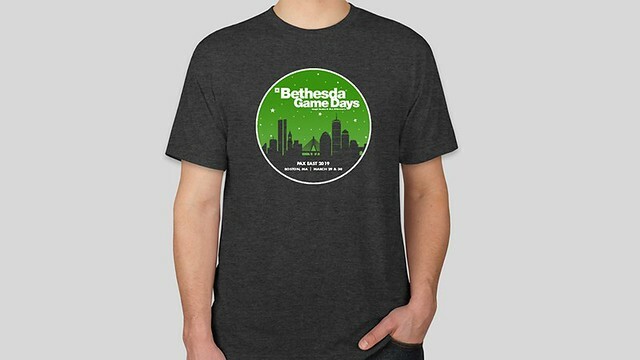 In addition to the demo swag and giveaways, all attendees received two free drinks, a free Bethesda Game Days t-shirt, and a free meal. Highlights of the event included panels for upcoming games and expansions, such as RAGE 2 and The Elder Scrolls: Legends. In respect to PR, Bethesda is a genius. As a big developer with their own dedicated following, Bethesda has the pull in the industry and the consumer demand to draw out fans. I’m not even a die-hard fan of an of Bethesda’s games but I went for the free stuff (as anyone does at a convention) and out of sheer curiosity. Bethesda had a captive audience of their target market right next door, but doesn’t have to compete with all the other big names and the overstimulation on the expo floor. Their event was all Bethesda and only Bethesda — they can bring as many games as they want, with as much space as they want, and do whatever they want. How many booths on a showroom floor can hand out free drinks? The most important and genius benefit of it all was the money. Just the space alone for a Triple A developer to have a presentable booth that fits all of their needs will rack up thousands of dollars a day. For a four-day convention, it begins to add up quickly. This is excluding the fact that the booths are just space which requires furnishing, decorations, computers and gear, electricity, lighting, carpeting, vending set-up, giveaways … the list goes on. When rented from the convention, there’s a high markup to the point where it’s often cheaper to just buy it. So, for the cost of a booth at the convention, Bethesda can design a more immersive event that truly rewards and delights their fans. I personally liked the atmosphere and the benevolence of Bethesda so much that I went home thinking about how I wanted to play more of their games. I respected their consumer-centric approach and now had distinct, positive memories associated with their company. That is the effect developer interaction should have on consumers. Don’t get me wrong though. I had positive experiences with other companies at PAX, but they all began to blur together during my time on the showroom floor (and they lacked distinction like Bethesda’s experience did). I remember my favorite developers like Square Enix, but they had already captured my attention and devotion so no extra effort was necessary. I enjoyed playing the Biomutant demo but enough that I want to dive into THQ Nordic’s catalog of games. Moves like the Bethesda Game Days are not a new approach for developers. This iteration of Game Days being a follow-up to the previous one at last year’s PAX East, and companies like EA, have their own versions for other conventions (see EA Play). These decisions by development companies are making waves in the industry, with major-player PlayStation announcing that they will not be attending E3 this June. I believe in developers like Bethesda, who are focused on treating their fans with a unique and memorable experience. Taking the money that would have been spent on a convention and giving it back to your fans is a critical indicator of the company’s values and focus as a game developer — they are consumer-centric. Meanwhile, some developers are so focused on money and disregarding the consumer wants. This is a refreshing change of pace. I am curious to see how this event evolves in the future and what other developers follow suit. What will this mean for expos in the future? Will we see a shift in expos being cast to the side with individual developer shows be the main attraction, or will expos evolve to meet the needs of the industry giants? Only time (and the consumers) will tell.